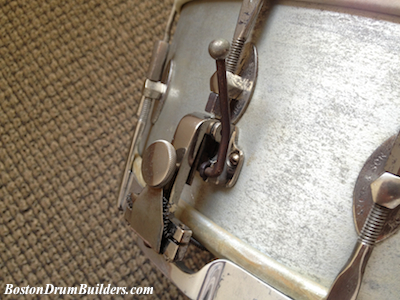 The 'R' word is grossly over used in drum collecting, but it probably applies to this one. One guy back in Boston said he had seen one before . . . in the 1970s. Another prominent collector said he had seen one in the early '90s and described this in an email to me as a "very, very, very rare drum". That's three verys. I have seen pictures of one before, but that would only amount to three sightings in 30+ years between the three of us. So I tend to agree. This is a Rare drum. It's a mid 1920s George B. 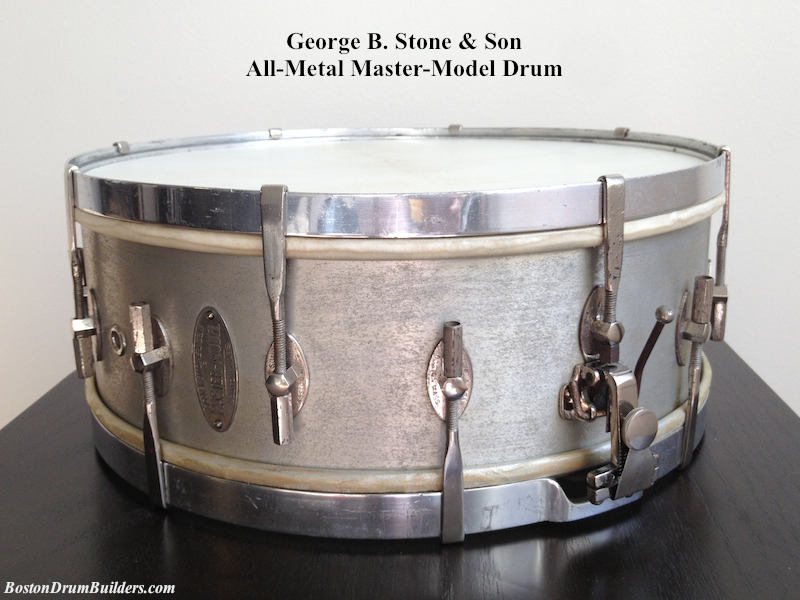 Stone & Son All-Metal Master-Model Drum. 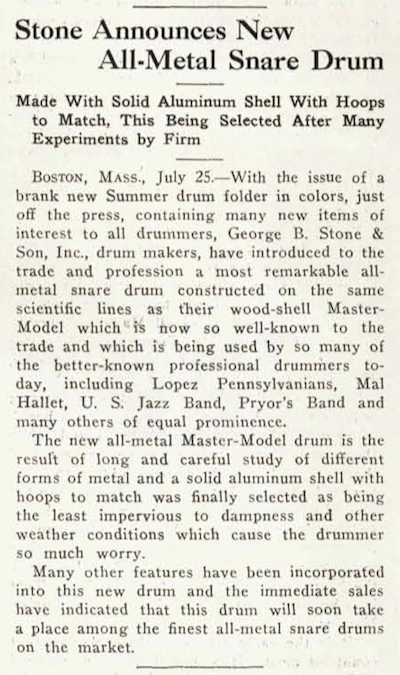 No such instrument is included in Catalog K (1925), but a press release published in the Music Trade Review in July of that year (pictured at right) describes the new drum. The shell is made of solid aluminum and is painted silver. The aluminum, unfortunately, is beginning to oxidize giving the shell a less even appearance than when it was new. The hoops are also formed from aluminum but are polished to a shine and are not painted. The top hoop is slightly shorter than the bottom hoop and the bottom hoop has pronounced snare gates one of which is larger than the other. 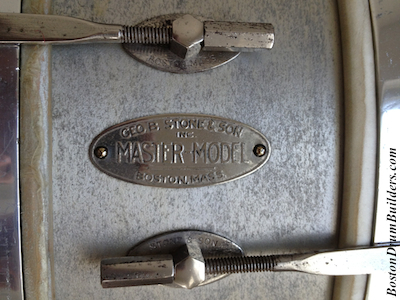 The remaining hardware is nickel plated and is all typical of mid - late 1920s Stone Master-Models. Interestingly, the all-metal version of the Master-Model utilizes only eight claws per head while their wooden shell brethren employ twelve each on top and bottom. The drum sports a silver Master-Model badge which is tacked into the shell three panels to the left of the throw-off. There is a simple, unadorned metal grommet one more panel to the left. 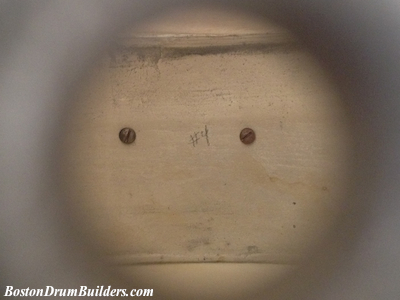 There is no paper label inside of the drum which is unusual for Stone. Instead, the number four is penciled on the shell and is visible through the air vent. This was either the fourth drum in a batch, or quite likely was only the fourth all-metal Master-Model to leave the factory. The workers at Stone & Son kept a running count of how many drums were being produced and while this drum bears no four-digit serial number, the hand written markings inside the shell are in keeping with those used by Stone on other drums. Both heads were broken when I received the drum so new calfskins from Stern Tanning were tucked on the original flesh hoops. Interestingly, the flesh hoops were painted silver at the factory to match the shell! I know the paint is original because pencil markings over the paint indicated that these were a factory matched pair of flesh hoops. These markings, again, are in keeping with those seen on other Stone drums. 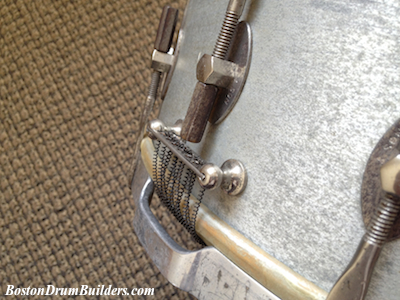 The original wire snares were intact so they were cleaned and remounted. The drum is now in as close to original condition as possible and is ready to be proudly displayed. Do you have a antique George B. Stone & Son drum? I'd love to hear from you! Send Lee an email at lee@vinson.net.